It’s overcast and gloomy by the time I get off the bus. The sky gathers clouds into granite clumps like Norse gods readying for an almighty battle. I’m surrounded by sheer rock walls that echo grey and black as though both sky and land are made of the same stuff. Any minute, I’m sure, the heavens will crack open and I, my backpack and the tiny village of Øvre Eidfjord will be drenched in icy rain and deafened by thunder. I know I should move on quickly and find the guest house before that happens, but I’m a little thrown by the view that surrounds me in every direction. 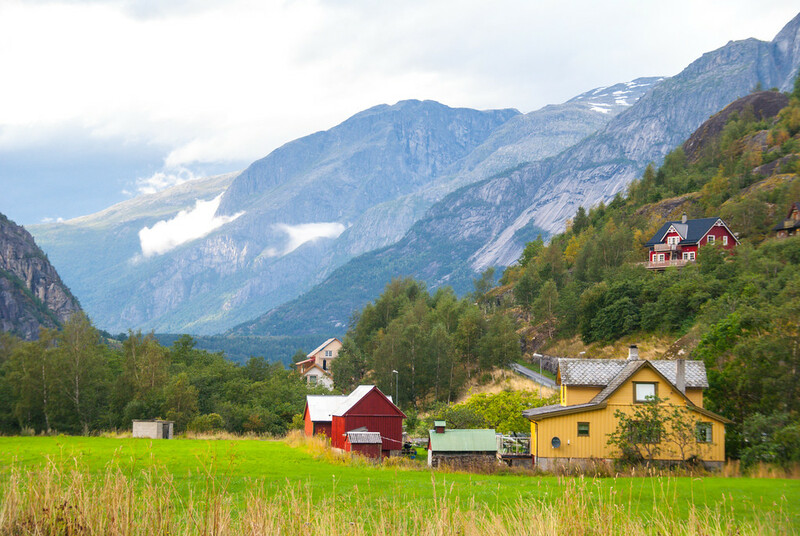 Rich green grass lining the road, brightly coloured wooden houses artfully scattered here and there, and everything – including the pregnant sky – is reflected in the glass of the fresh-water fjord. 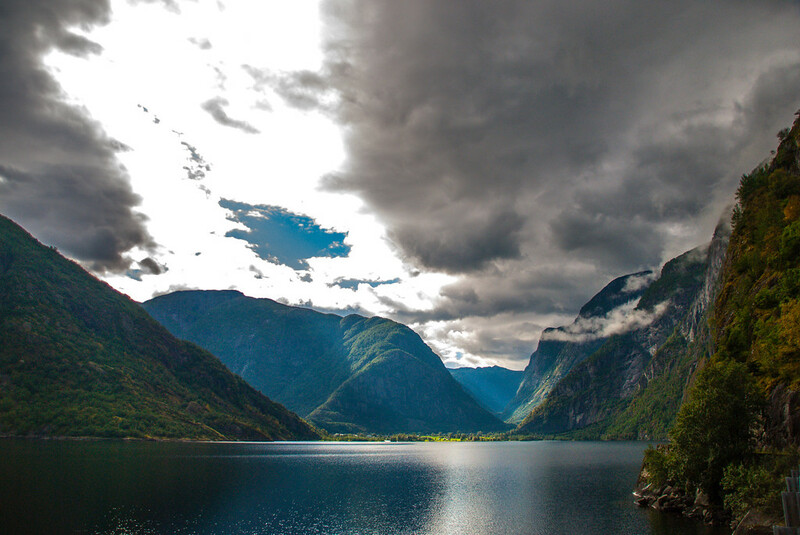 Øvre Eidfjord is sandwiched between Europe’s biggest plateau, Hardangervidda, Norway’s most popular waterfall, Vøringfossen, and the village’s bigger, more popular brother, Eidfjord. As a result, visitors either slip by without a second glance, or they don’t come here at all. Which is a big mistake. Huge. Eidfjord Gjestgiveri (guest house) is a five minute walk from the bus stop in a flat, straight line (good news for anyone carrying a pack) along the main road. A crisp, white wooden structure built in the Swiss style in 1896, it was once named after it’s original owner and builder, Lars S. Sæbø and has a vivid history, both in opening up the area for visitors, and as an aid to escaping British naval officers during the Second World War. After the war, Sæbø and the other villagers who helped the officers get home were awarded the George Cross, one of Britain’s highest military honours. The guest house was kept in the family until 2002, when it was completely renovated and huts, an annex and a curiously decorated terrace were added. 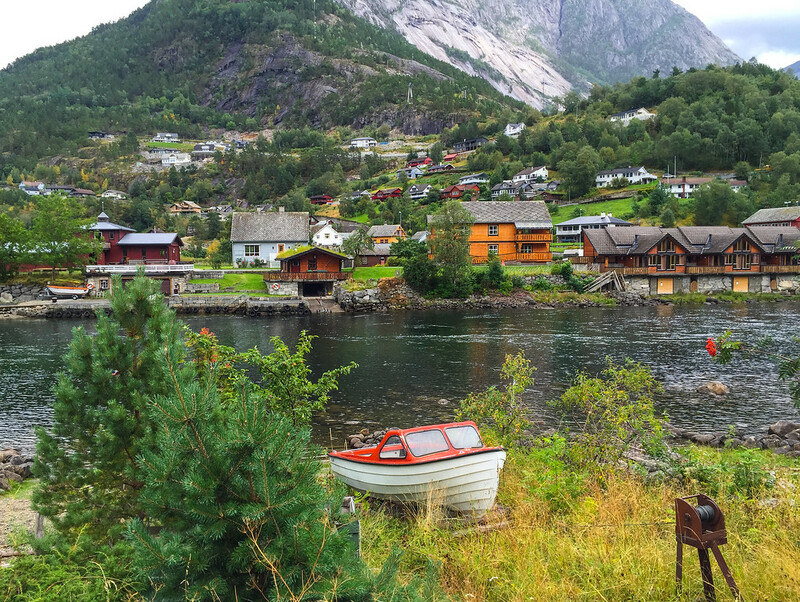 I found Øvre Eidfjord by accident – which I’ve found happens a lot in Norway. I’d planned to spend a couple of days in the area. 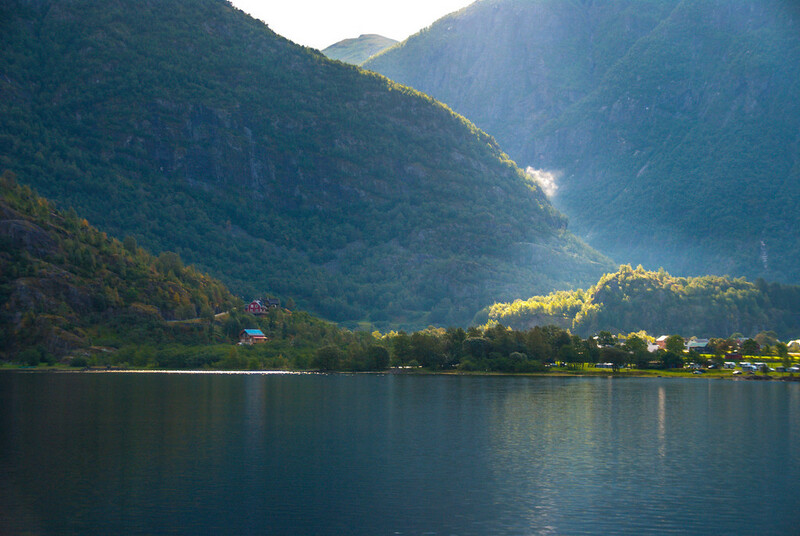 Just 6km up the road is Eidfjord, daily infested with swarms of cruise ships from Bergen 150km away. 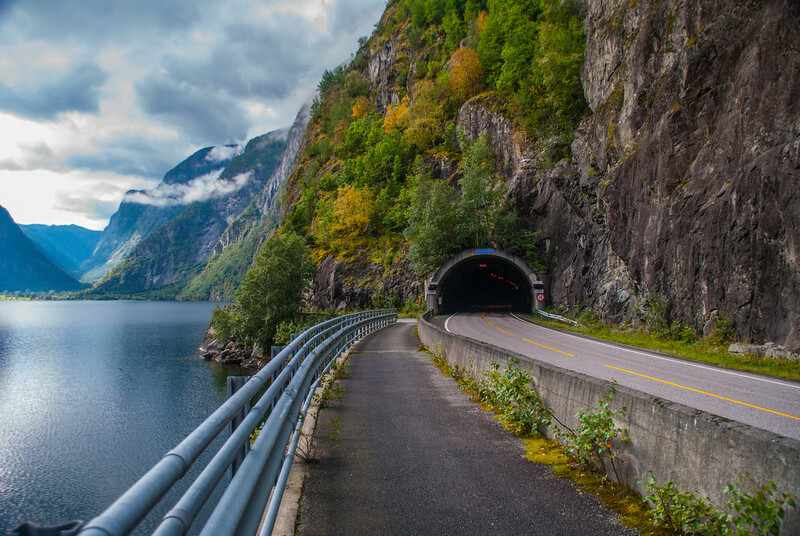 Eidfjord has some wonderful attractions – from hiking, fishing and sites to see – but the only accommodation available was in the I-could-buy-a-car-for-less category. However, I found a little guest house in Øvre Eidfjord at a reasonable price and booked it without any idea of what I would find when I got there. I got one of the small but very clean cabins that included beds, bedding, table and chairs, fridge and a small but usable kitchenette and most important of all – a heater. Bathrooms are in the main building, which is the only downside. On the upside however, is the terrace in the main building. 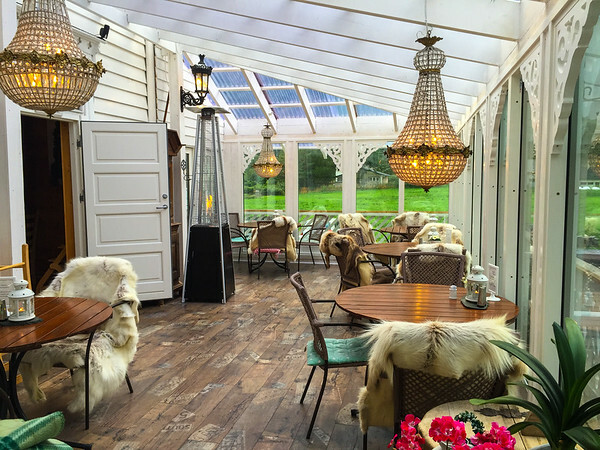 At first glance, it just appears to be cosy and delightful – until you notice the odd floorboards with American licence plates stamped into them, the faux Louis XVI furniture alongside modern outdoor tables and chairs, the twinkling crystal chandeliers and the faintly peculiar presence of the stuffed reindeer just inside the front door. I took to saying hello and goodbye each time I passed it. It’s okay. I know I’m odd. Reindeer are, of course, native to Norway, and to Hardangervidda in particular, although it’s rare to see a herd while you’re hiking up on the plateau as they’re pretty good at staying away from prying eyes. Norway is deadly serious about conservation of what many people believe is the most beautiful country on earth. As a result, herds are sustainably managed with one of the world’s best management programs. For the locals, the meat is a diet staple and local to the region. 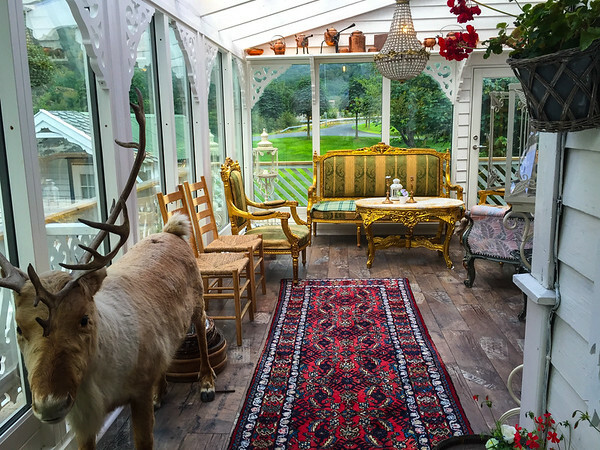 Reindeer skins are draped over the guest house terrace chairs. You sink into them as though into the arms of a long-lost lover, and they keep you as warm. Across the road is a camping ground hidden by a farm and a small stand of trees and seems to be frequented by hearty Germans and Swedes who come to the guest house for their famous pancakes. Of course, everybody speaks English – something that both pleases me and makes me feel somewhat inadequate. I get instructions from the owner on how to walk down to the fjord and where I can hire a bicycle. By the time I head outside the threatened rain has retreated, leaving blinding white clouds sharing the sky with a stunning and delightful blue that’s promptly reflected in the water. A gentle wander along a dirt track leads me to the edge and I spend the next hour going dizzy as I happily spin around taking photos in every direction. Øvre Eidfjord is that kind of gorgeous. That night I have dinner at the guest house. From the extremely limited menu, I choose the Norwegian classic, meatballs and gravy. The meat is solid and not at all like the fatty meatballs I’m used to – but there’s a good flavour there, and plenty of gravy to keep them moist. I’m sure this isn’t the best version of this dish, but its okay for only my second dinner in Norway. The next morning is spent doing something absolutely essential for every traveller away for more than a week: nothing. I’d been on the road for six weeks by this point, and I needed some time out. So I spread my stuff out on one of the terrace tables and caught up on emails, diary and other dull but otherwise-essential admin that even travelling to the farthest reaches can’t leave behind. When the German pancake-hunters arrived I decamped and scanned the timetable for the next bus to the area’s biggest drawcard – Vøringfossen. Only problem was, the next bus was two hours away. Now, I wouldn’t do this just anywhere, but in Norway – well, what can I say? We hitchhiked. Yep, I stuck my thumb out and after only ten minutes, we got a lift with a lovely man from Bergen called Espen. Espen is a taxi driver and was on his way to Oslo. 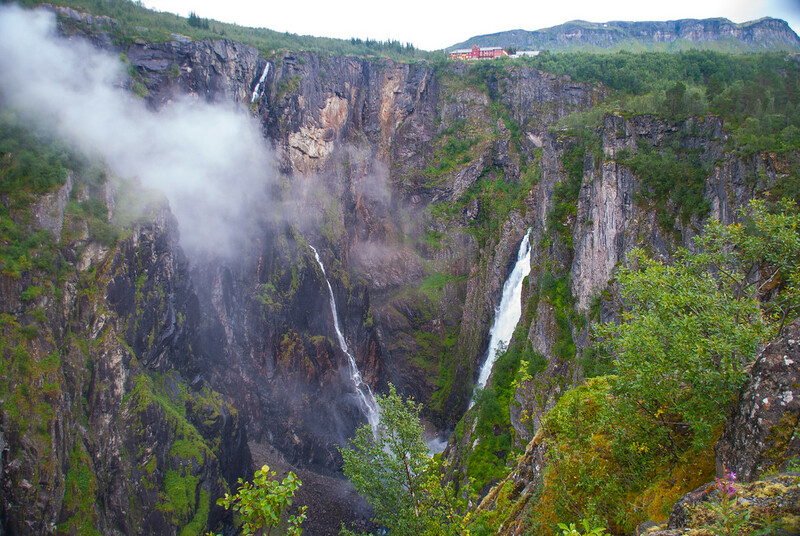 It was just a fifteen minute ride to Vøringfossen but in that time he spoke of his astonishment that we could arrange our own travel to get to this place without being part of an organised tour! He was very sweet with a kind of charming innocence and gave us his phone number so that when we get to Bergen, he and his wife could show us around. What is it about giant waterfalls that none of us – no matter where we’re from – can ignore? And this one’s a doozy. Originally thought to be 280 meters high, it’s been officially measured at 182 meters. It says a lot about Norway that Vøringfossen is only the 83rd highest. Clearly not trying hard enough. 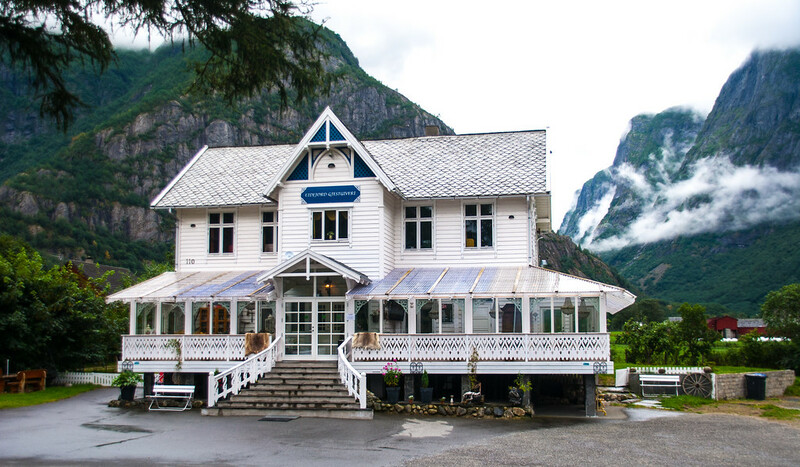 Largely unknown by other than locals, in 1880 Ola Garen built a hotel above the waterfall – an almost insane idea given that every item of construction had to be lugged all the way from Bergen and then up a path with 1,500 stairs. The Hotel Fossli opened in 1891 and was built in the Art Nouveau style by architect Frederik Konow Lund, one of the leading architects of the period and closely aligned with the Arts and Crafts movement. Famously visited by European royalty, Edvard Grieg wrote his Opus 66 while staying at the Hotel. The best views of the waterfall are from the Hotel which still retains its charm. Of course, the most dangerous, hair-brained and insane views are the ones I threw myself into, climbing out onto the most narrow precipice to take my share of photos as the long-awaited rain spattered across the already soggy landscape. Slices of soft mist draped themselves artfully across the canyon as the ground trembled under the unceasing pounding of water. Only the bravest of souls were out in that weather, but in between were flashes of brilliant sunshine that caught both droplets of water and lilac wildflowers. We had every intention of hitching back down the hill – but the bus arrived first. Thus ended my attempt to be a totally badass hitch-hiking traveller. Oh well. The next morning was our last in Øvre Eidfjord and we planned to see as much as possible. It began with breakfast at the guest house at which I was introduced to the Gjetost – a brown Norwegian cheese made from goat’s milk. It’s made by slowly heating whey, which helps give it a rich and intense flavour I really liked. A short walk up the road is the home of Flat Earth Adventures, who offer myriad opportunities to enjoy the wonderful outdoors. 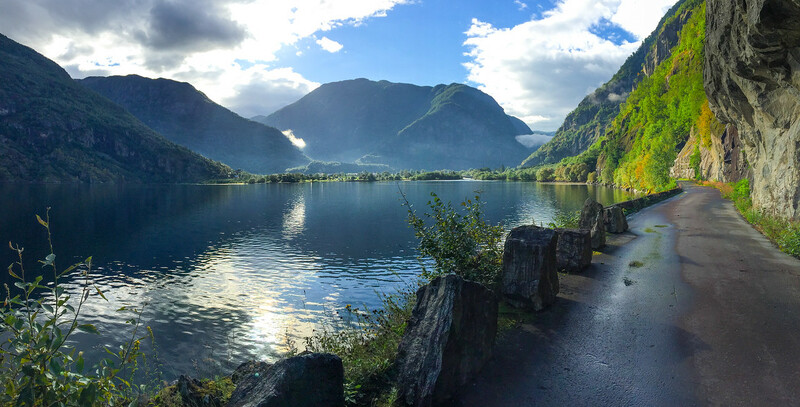 Fjord kayaking, hiking, white-water rafting and our choice for the day, bike riding. 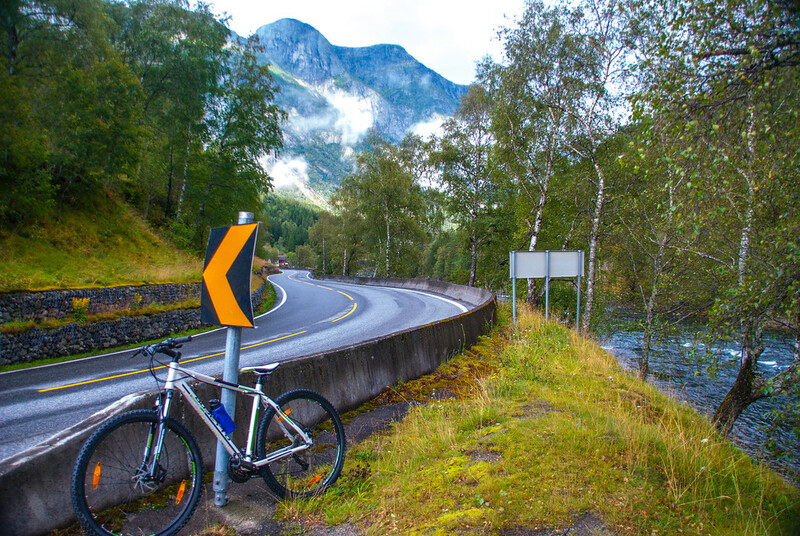 We rented bikes and headed off towards Eidfjord on the old road running alongside the fjord. 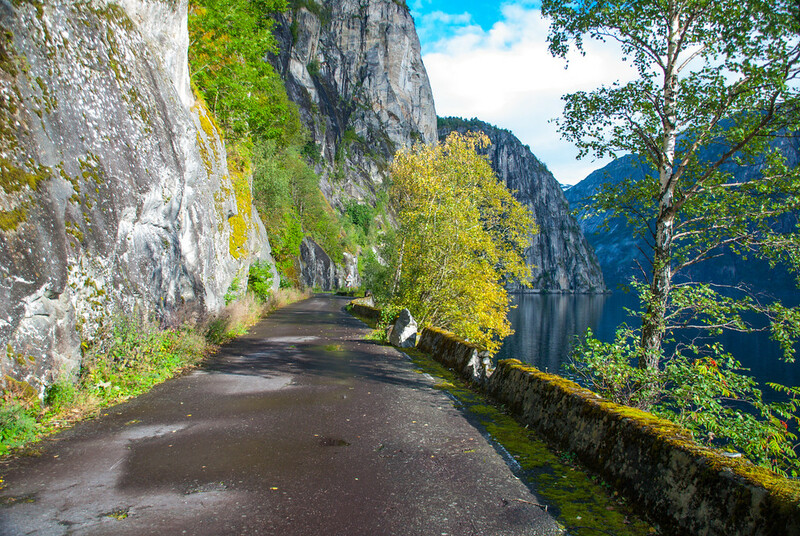 This is now a foot/bike path only since the new road was built by tunnelling through the unbelievably hard rock on which most of Norway sits. This left us with a peaceful and beautiful route along a largely deserted fjord. Even the weather smiled on us. Things they don’t tell you before you set out: the bike seats are built for boys hardened to such things and therefore provide absolutely no padding for your nether regions. Not so bad when you’re only riding for twenty minutes. Catastrophic if you need to sit on it for a single minute longer – let alone three hours. I won’t go into the new and inventive swear words I cam up with to describe the pain I was in. We don’t need to go there. The other thing they don’t tell you before you set out is that the bike path actually joins the real road a number of times, where there is little or no space to share the lane with both cars and trucks. I find this a tad hairy – but maybe that’s just me. Still, the ride was just gorgeous and we came to a stop at the end of the fjord, where the land curved around providing camping and fishing spots in abundance. Riding back was painful, but hell, who cares when you have scenery like this to distract you? We dumped… er, returned our bikes, grabbed our packs and got on the bus for the 6km trip to Eidfjord where we wandered around for a couple of hours until our bus south left. Fortunately, we arrived between cruise ships, and so could enjoy the tiny village in peace. It only enhanced our experience of the area. So I never did the serious hiking I’d planned, or the white-water rafting I’d fancied myself being brave enough to try. But I did discover a hidden gem that I totally fell in love with. If I’m ever this way again, I’ll stay longer, take it slowly – and then decide whether I really want to go white water rafting after all. If you’re driving, just follow the Rv 7 from Oslo to Bergen. 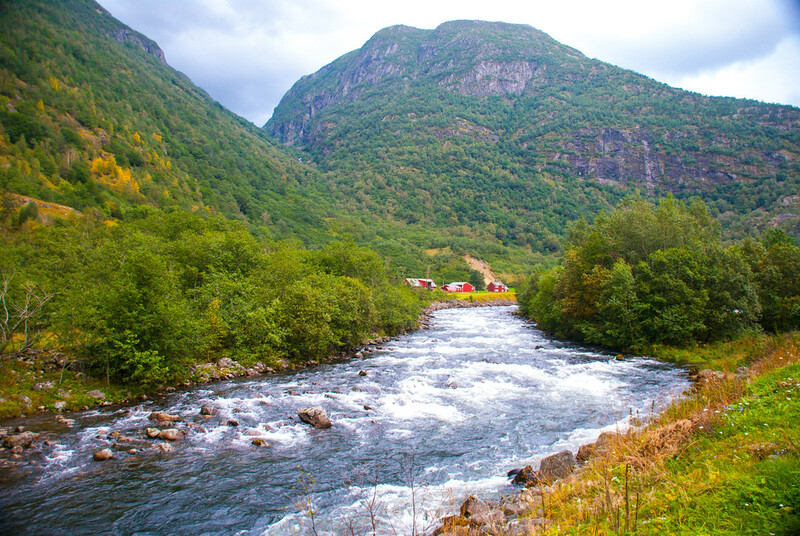 By train from Oslo, disembark at Geilo and then a bus will take you all the way to Øvre Eidfjord. There are a few accommodation options available besides the guest house, including some nice places on AirBnb. 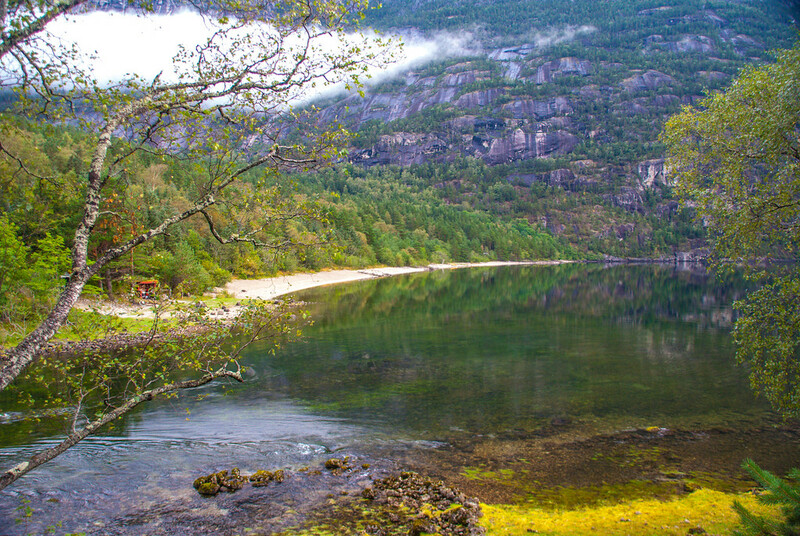 Coach tours from Eidfjord will take you through Øvre Eidfjord and up to Voringfossen. Coaches will also stop at the nature centre in Øvre Eidfjord.